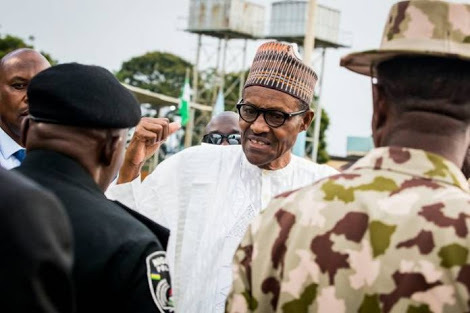 President Muhammadu Buhari yesterday met troops battling bandits, kidnappers and criminals in Zamfara and neighbouring states under Operations Sharan Daji and Diran Mikiya. Addressing them at the Umar Musa Yar’Adua Airport in Katsina State on his way back from Daura to Abuja, Buhari charged them to remain ”ruthless” in the battle against the criminals. He added: “What is happening in the areas of operations is disgraceful. I’m very pleased with the way officers and men are firmly putting it down and I want you to be as ruthless as humanly possible. Nigerians deserve some peace. ”The country has to be secured to be managed…we have been doing our best and we depend a lot on you to do what is needed in the field. I do not want you to spare any cattle rustler, armed robber or any person who thinks he is above the law. He commended them for a job well done so far and donated five bulls to the security personnel in the spirit of Sallah and in appreciation of their efforts. During the interaction, the president applauded officers and men of the Nigerian Air Force (NAF) and the Army for the counter-offensive against bandits in Zamfara State and its environs. He urged officers and men to keep up the good work in the results achieved in dealing with banditry, kidnapping and cattle rustling in the affected states, within the short period of the operation’s existence. In his brief to the president, Air Vice Marshall Sampson Akpasa, the Air Officer Commanding Special Operations Command, NAF, said locations such as Mashema, Shinkafi, Ajia, Rafi, Shamashalle, Zurmi and Galadi in Zamfara State, previously used as staging and trading bases by the bandits have been made untenable through sustained air interdiction and armed reconnaissance. ”The air efforts in the last couple of weeks also provided close air support to ground troops on various occasions. Additionally, the Air Task Force(ATF) responded to several distress calls from sister security forces and locals by neutralising the identified massed bandits and preventing imminent attacks on villages/towns such as Yanwari and Hayin Alhaj,” Akpasa said. The unannounced visit was intended to appreciate the work of the soldiers. The federal government had, on July 29, assembled the 1000-strong military personnel, comprising the army, air force, police and the civil defence to help in tackling the activities of the bandits.